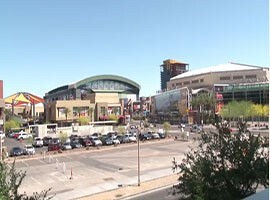 Businesses in downtown Phoenix saw explosive numbers during Super Bowl week. It was just the beginning for the newly crowned sports hub that will host the College Football Playoff National Championship Game in January and the Men’s Final Four in 2017. “These opportunities are great opportunities to help drive the economy, but they are one-time opportunities,” said Jennifer Mellor, vice president of economic development for the Greater Phoenix Chamber of Commerce. Hence the chamber’s new initiative, Phoenix Forward, which is currently under development. Phoenix Forward was started as a result of big events like Super Bowl XLIX coming to the Valley. Its intention is to help existing businesses grow and prosper. Local businesses, as well as Mellor, think the Super Bowl was a huge a success downtown but acknowledge some improvements can be made for future events. “To stay competitive in a global market for these events we need to build transportation initiatives, building on our hotels and collaborate within our cities,” Mellor said. Ross Dafoe, general manager of The Strand, said the downtown Italian eatery is considering expanding its patio space and indoor seating to accommodate the big events headed to Phoenix. Super Bowl XLIX set the financial windfall for downtown in motion. Downtown Phoenix, anchored by Verizon Super Bowl Central, a 12-block outdoor fan fest, welcomed more than 1 million visitors from around the world during the week leading up to the big game. Jon Ericson, a manager at the Renaissance hotel who worked on three Super Bowls in South Florida before planning February’s game, said he was overwhelmed by the hotel’s booming success. “The economic impact in a centralized location like Phoenix is one that I have never witnessed before. The numbers simply blew us away. Food and beverage alone did $145,000 more in revenue compared to last year,” Ericson said. The Renaissance, like many downtown hotels, had a contract with the host committee put into place four years in advance. Most hotels set their rates based on averages from that year, per the NFL’s request. The Strand saw an increase of about 400 percent in sales every day from Thursday to Sunday of Super Bowl week. “Not just us, but all of downtown Phoenix crushed it,” said Dafoe. That includes the Hard Rock Café. Celebrity sightings were not uncommon during that week. “We had a couple big comedians come through, and Marshawn Lynch was on our waiting list,” Wells said. Several establishments, including Stand Up Live, Copper Blues and Lucky Strike, were closed to the public, renting out their space for private events. Much like the Hard Rock, the Tilted Kilt in CityScape made the decision to stay open, and received advice on handling this type of crowd. The last time Phoenix hosted a Super Bowl in 2008, Arizona State University’s W.P Carey School of Business reported a $500 million bottom line. The official numbers for this most recent Super Bowl are not available yet, but a much higher tally is expected for 2015. Super Bowl XLIX was played in Glendale, but with so many associated events taking place in downtown Phoenix, businesses in the city's core posted enormous numbers and are looking forward to additional major sporting events coming to the Valley of the Sun. A server at the Hard Rock Café in dowtown Phoenix puts an order in. Restaurants like the Hard Rock saw huge economic gains during the two weeks leading up to the Super Bowl.